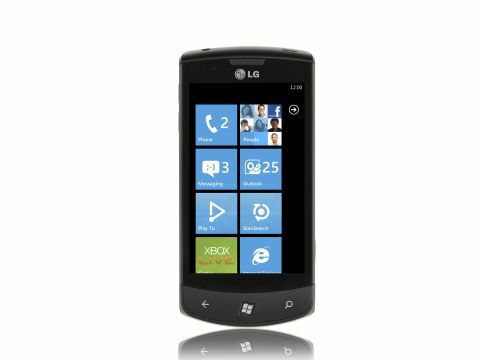 Is LG's Optimus 7 the prime Windows Phone 7 handset? Windows Phone 7 has arrived an array of different handsets, so here we're looking at LG's entry: the Optimus 7. Microsoft sets out some design rules for Windows Phone 7 hardware, and there are some ways in which the Optimus 7 is very like all the other Windows Phone 7 handsets out there, such as the HTC HD7, Samsung Omnia 7 and HTC 7 Mozart. There's a camera button on the right edge and three shortcut buttons on the front: Search, Back and one to take you to the Windows Start screen. You'll find these on all Windows Phone 7 handsets. There's also the usual smartphone goodness of Wi-Fi, 3G and GPS. HSDPA support runs to 7.2Mbps download and 5.7Mbps upload. A five-megapixel camera sits on the back, and there's a generous 16GB of internal memory. The memory quota is actually quite important with Windows Phone 7 because no Windows Phone 7 handset caters for hot-swappable memory via adding your own microSD card. You're stuck with what's there from the outset, so you need to be sure it's enough to meet your needs. 16GB is currently the maximum available, so that puts the LG Optimus 7 in a good light. Despite Microsoft's 'rules' for smartphones carrying its OS, there are some features here that you won't find on other Windows Phone 7 handsets. Quite naturally enough, really, since manufacturers want to differentiate one smartphone from all the others. Most notably for the LG Optimus 7, there's a panorama camera mode, an app called ScanSearch, and a feature called PlayTo for DLNA. If you want the ultimate review of the Windows Phone 7 software itself, then check out our in-depth look at the OS. The LG Optimus 7 is a bulky old thing. It's a massive 125mm tall, 59.8mm wide and 11.5mm thick. That height doesn't actually mean there's an oversized screen here. What you get is a 3.8-inch screen with 800 x 480 pixels. We do like the screen, which is capacitive and ultra-responsive. We've found in general that tapping away at the on-screen keyboards and icons of Windows Phone 7 is a positive experience, and the LG Optimus 7 provides us with more of the same. We actually sighed with pleasure that Microsoft has at last consigned its teeny icons and menus based system to history. The physical design of the LG Optimus 7 leaves us slightly unhappy, though. There's quite a lot of empty space above the screen, and the three under-screen buttons are in an area that's oversized for our tastes. We'd have liked more streamlining, to be honest. In fact, the three buttons are a bit weird. The start button looks like a stuck-on tile, though it is a real button that you press in. The back and search buttons also press in, but they're flush to their surroundings. It's all nowhere near as sleek as the touch buttons on, say, the HTC 7 Mozart. The general build is fairly premium, and we particularly like the metal backplate. There's a rubberised finish to the rest of the chassis which helps with grip. The micro-USB slot that you'll use to charge the battery is under a hinged protective cover on the right side of the chassis.